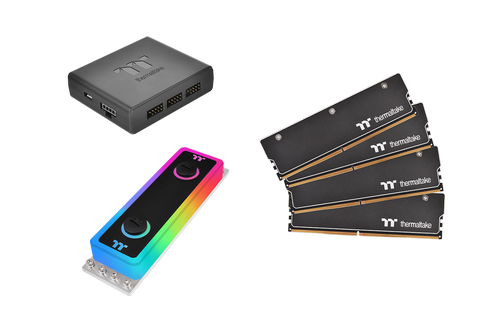 Las Vegas, United States－January 9th, 2019－ Thermaltake, the leading PC DIY premium brand for Cooling , Gaming Gear and Enthusiast Memory solutions, announces the immediate release of its groundbreaking product today, the Thermaltake WaterRam RGB Liquid Cooling DDR4 Memory. 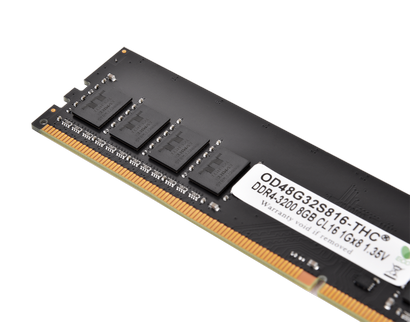 An unprecedented DDR4 memory module integrated with liquid-cooling solutions. This is the world’s first two-way cooling DDR4 memory that comes with its own 16.8 million colors software-controllable water block. 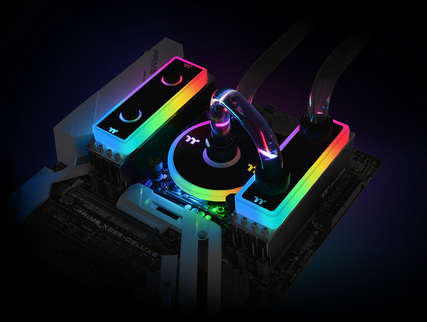 The WaterRam RGB offers ultimate flexibility for cooling options, with the exclusive liquid cooling technology, Thermaltake lowers the temperature of the RAMs by 37% compared to traditional natural passive cooling solutions, which ensures stable and instant performance and longer lifespan. While WaterRam RGB ensures peak performance, it is also gorgeously built with 12 high lumens addressable LEDs of 16.8 million colors that can be controlled by the TT RGB PLUS Ecosystem and sync with motherboards from ASUS, GIGABYTE, MSI and AsRock that have a 5V addressable RGB header. The WaterRam RGB Liquid Cooling Memory was crafted for excellence and takes your system to a whole new level! WaterRam RGB incorporates the latest technology in the market to support high intensity gaming or other high speeds required activities. Built with 3200MHz high speed that supports Intel XMP 2.0 one-click overclocking technology and low CL16 latencies, WaterRam RGB was tested on the latest Intel DDR4 motherboards to ensure optimal DDR4 performance. WaterRam RGB is Intel XMP supported, you are only one BIOS-setting click away from extended overclocking performance. 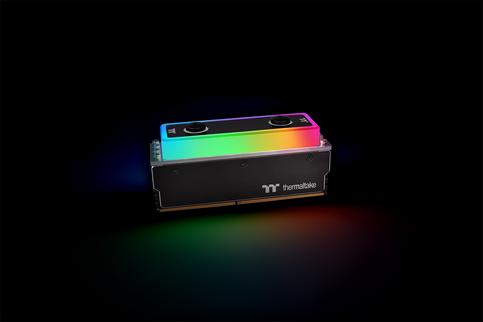 Thermaltake WaterRam RGB Liquid Cooling Memory is now available for purchase, via the Thermaltake worldwide network of authorized retailers and distributors. 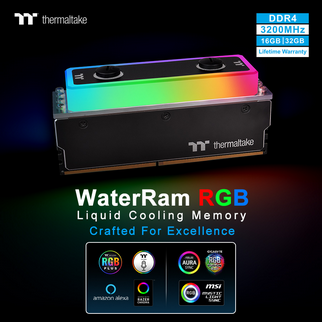 Thermaltake WaterRam RGB Liquid Cooling Memory is backed by a limited lifetime warranty for the RAMs, two-year warranty for the waterblock and supported by the Thermaltake worldwide customer service and technical support network. 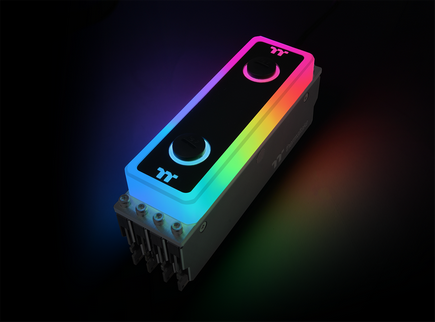 For up-to-date pricing of the Thermaltake WaterRam RGB Liquid Cooling Memory, please refer to the Thermaltake website or contact your local Thermaltake sales or PR representative.